Variegated Chinese Privet is a semi-evergreen shrub that is useful for brightening any dull areas. The leaves are a matte green with irregular creamy white margins, variegation can fade in overly shady conditions and with excess cold temperatures. Ligustrum sinensis ‘Variegata’ is a fast grower, growing 4-6 feet tall and equal in width and has a more horizontal branching pattern than the species. 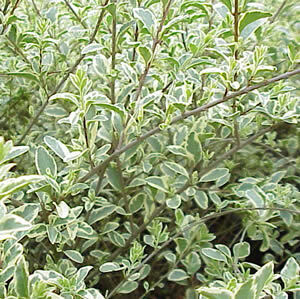 This shrub will produce fragrant white flowers in early summer. Keep trimmed to retain a dense growth habit.